Where else could life exist besides here on Earth? Recent discoveries of large organic molecules in interstellar gas clouds and in comets show that the building blocks of the life are spread all over the Universe. When these building blocks of life reach a habitable place they might evolve into life. It is exciting to think that life could exist somewhere else besides Earth. As we already know, most planets and their satellites are quite hostile places with few exceptions. Mars is the most promising candidate for a habitable planet due to the fact that liquid water formed on its surface hundreds millions years ago. Where there's water, there might be life. Another likely place for life to evolve is Jupiter's moon, Europa, because of its subsurface ocean. The exotic moon, Titan, orbiting Saturn, could also develop simple life forms. Keep reading to learn more about possible life on Mars, Europa, and Titan. Mars, the closest planet to Earth, has always seemed a likely place for life to exist. Science fiction stories about Martians fueled our imagination for generations. When scientists first saw what appeared to be water channels it seemed to actually have signs of life, but when we finally sent spacecrafts there we found a cold, dry, dead-looking world. However, scientists keep looking for any evidence that life could have existed on Mars. Pictures taken by the Mars Global Surveyor and Mars Renaissance Orbiter spacecraft could be the best evidence that Mars might have water beneath its cold, dry surface. These pictures show channels and gullies in the edges of canyons on Mars. This means that in the last few million years there was flowing water of on Mars, and maybe that water continues to flow beneath the surface today! NASA is planning a new mission to Mars that will examine soil for evidences of life. The subsurface ocean makes Jupiter's satellite Europa one of the most probably places for life in the Solar system. Great pictures taken by the Galileo spacecraft showed Europa's surface is covered with ice. The ice is full of domes and ridges that appear to be cracks in the ice! The surface consists of broken crustal plates. Scientists think that the presence of these cracks and plates means that the surface is very young indicating recent geologic activity. The cracks could mean that there is a layer of liquid water under the surface. Data from Galileo's magnetic-field detectors also showed that there is an electrically conductive layer, most likely a salty ocean below the surface. Where there's water, there could be life! Titan is the second largest moon in the Solar system, discovered by Christian Huygens in 1655. In the 1940's Gerard Kuiper discovered lines of gaseous methane in Titan's spectrum, which suggests Titan has an atmosphere. 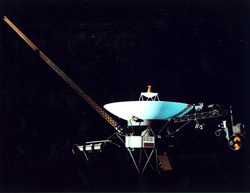 The Voyager radio and infrared spectrometer experiments provided detailed information about this thick hazy atmosphere. Like Earth, Titan�s air is composed mainly of 80% nitrogen. The other components, such methane (CH4), ethane (C2H6), acetylene (C2H2) and various hydrocarbons create a haze, like smog, which blocks the view of the surface. These compounds condense and rain down on the icy surface, like water does on Earth. Recent images confirmed that there are large methane lakes on the surface. Although, we can find all basic chemicals needed for life, the extremely low temperatures probably prohibit the evolution of life. However, when the Sun becomes a red giant Titan might be able to support life. Saturn's tiny moon, Enceladus, wasn't anywhere scientists expected to find prospects for life, but pictures from the Cassini spacecraft show geysers erupting from the south pole. One possible explanation is that the icy particles get spewed out from close to the surface reservoirs of liquid water. The Enceladus geysers are probably cold versions of the hot geysers in Yellowstone National Park. Scientists think that heat from high pressure generates the geysers. Internal radioactive decay and tidal flexing may create liquid water pockets under the surface. If flybys over Enceladus prove that geysers are due to liquid water, this would be the first direct confirmation of the existence of liquid water in Solar system, beside the Earth. Terraforming is the process of making a hostile environment suitable for life. Some scientists think that it is possible for us to transform a planet or moon into an environment similar to the Earth by modifying temperature, atmosphere, topography and even ecology. Mars would be the best choice for such an experiment because of its proximity to Earth. The images sent by the two Mars rovers, Spirit and Opportunity, showed indisputable evidence of the existence of liquid water in the far past. Photographs revealed rippled layers of sediment, which could form only on sea bottoms. The mineral composition of some rocks also provides evidence of past water. Image courtesy of NASA/JPL/University of Arizona. The surface of the Europa is heavily bombarded by space radiation. This can both create and kill the life. The strong radiation could catalyze chemical reactions that produce complex organic molecules, which are the building blocks of life. However, these organics could also easily be destroyed by harsh rays. However, if these organic compounds could be dragged down to the subsurface ocean, they would probably be protected and might evolve into life. 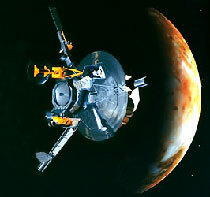 Launched on November 1996 by NASA, the MGS was able to study the climate of Mars and to map out its surface in high resolution detail before losing communication on 2006. MRO's mission goals were to view the surface of Mars at as high a resolution as possible from orbit to help NASA better understand about landing sites for the rovers Spirit and Opportunity. Dutch astronomer and mathematician, born in 1629, who discovered Saturn's moon, Titan. Also known for his studies and observations of the Orion Nebula, as well as his work in optics and physics. Dutch-American astronomer known for his discovery of the moons Miranda (Uranus) and Nereid (Neptune), as well as numerous binary stars. The Kuiper belt is named in his honor. A hydrocarbon and colorless gas often found in the atmospheres of gas giants, such as Saturn. A type of air pollution. The sixth largest of Saturn's moons, discovered by William Herschel in 1789. In 2005, plumes of icy liquid were discovered shooting of its south pole .